This Crock Pot Ranch Chicken is one of our all time favorite ways to make chicken in the crock pot! It is packed with delicious ranch flavor and with only a handful of ingredients it is quick and easy to make! The slow cooker does all of the work in this crowd pleasing recipe, making the chicken perfectly tender and juicy. 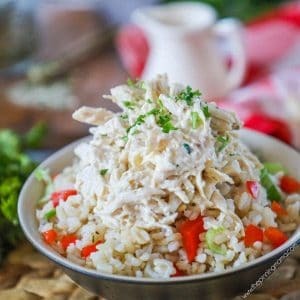 You can serve the Crock Pot Ranch Chicken as the main part of your meal over rice or greens, or use it in salads, sandwiches, pizza, stuffed peppers, grain bowls, and more! If you love ranch, you need to keep this recipe handy because there are so many great ways to eat it! Growing up in Texas, ranch was just a part of life. It went on everything from salads to pizza and pretty much anything in between. As an adult, I learned that this might not be as normal in the rest of the country, but my deep rooted love was already planted. I have made countless things throughout the years with ranch and find that when you use the seasoning to flavor a dish, it grabs the great flavor even better! 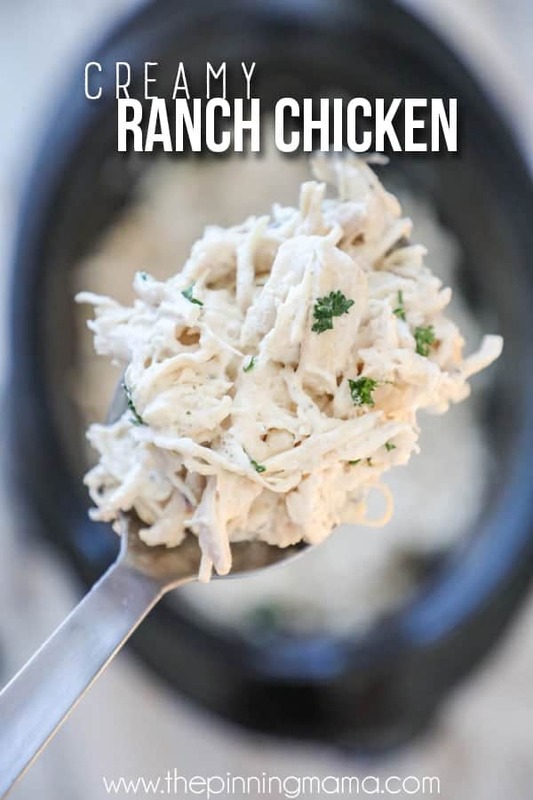 I have shared a lot of well loved Ranch recipes on the blog already like my favorite homemade ranch dressing mix, this bacon ranch chicken, how to make dairy free ranch, Buffalo Ranch Chicken Salad, and even a personal favorites like these Ranch Smashed Potatoes and Barbecue Ranch Chicken Nachos. Today’s recipe though is really a game changer! It is one that you can bookmark in your recipe book because it is so perfect for so many things. This Crock Pot Ranch Chicken recipe shines like a star when you need a quick and easy dinner. First of all, it is a crowd pleaser! It is hard to find someone who won’t think this recipe is perfectly delicious. You can serve it the first night as the star of the show over rice and greens, and then keep the leftovers to make other meals throughout the week (or freeze them to use throughout the month!) I will talk all about that below so make sure to take a peek and see all the delicious ways to use it! The absolute best thing about this Crock Pot Ranch Chicken (besides how delicious it is, of course) is the number of ways you can serve it. It is anything but boring when every time you make this, you can serve it up in a new and exciting way. Over a grain- serve a big scoop right on top of rice, quinoa, farro, or your favorite grain. Offer toppings like chopped green onion, red bell pepper, cheddar cheese, tomato, etc so everyone can customize their bowl. With potatoes- you can put it right on top of a scoop of mashed potatoes or serve it with a side of garlic smashed potatoes. Pasta- Serve it with a side of pasta salad, or right over top of some pasta tossed with olive oil and garlic. Over cauliflower rice- I have a whole post on how I prep and freeze cauliflower rice so it is always ready to go! On top of a big salad- Try chopping crispy romaine or a bed of spinach with chopped green onion, red bell pepper, cheddar cheese, tomato, or any of your favorite salad toppings. You can drizzle it with extra ranch afterward too! With roasted veggies- you can do green beans, carrots, squash, brussel sprouts, cauliflower or a mix of any of them! Over sauteed greens- Serving this Crock Pot Ranch Chicken over a bed of sauteed spinach is my personal favorite way to eat it! Probably not my kids, but I think the tender greens pair perfectly and give it a great health boost! You can serve the Crock Pot Ranch Chicken with one of these ideas, or mix and match a few. If you have another way to serve it that you love, please leave me a note in the comments so I can try it out! You can use the leftovers of the Crock Pot Ranch Chicken to make these, or many of them are so good you might find yourself making up a slow cooker of this chicken just so that you can make these meal ideas! These are just a few ideas to get you started but the ideas are really endless. I would love to hear what creative meals you make with this! Leave me a note in the comments to let me know! This is a super simple recipe! I am going to walk through it with you here to share some notes and tips so that it should answer any questions that might pop up while cooking. There is a full, printable recipe card at the bottom of this post for your convenience. 2 lbs chicken breast– This will be about 3-4 chicken breasts. You can also double the recipe if you would like to make more. You can also use chicken tenders or other cuts of chicken if you prefer. 1 packet Hidden Valley Ranch seasoning, or two tbsp homemade ranch seasoning, 1/2 tsp reserved- You can use either prepackaged ranch or homemade seasoning. Both work and both are delicious. With either one, you will want to set aside 1/2 teaspoon of the seasoning that you will save to add in at the end. 8 oz cream cheese, softened- I use original Philadelphia cream cheese, but you can also substitute low fat or neufchatel cheese here. Just 3 easy steps to a slow cooker full of creamy ranch goodness! I prefer to cook on high for 2.5 hours when I cook chicken breast in my crock pot. This prevents it from becoming overcooked and gives it the most tenderness with the best texture. At the end of the cook time, remove the chicken. Shred it using 2 forks or an electric mixer, it should be tender. Drain the broth, reserving 1/4 cup of the broth. You will use this reserved broth in the next step. Place the shredded chicken, the reserved ranch seasoning and broth, and cream cheese back into the crock pot and stir until everything is evenly combined. The warm meat and crock pot should make blending the cream cheese into the mixture easy. If the cream cheese is still cold, you may want to let it sit in the warm crock pot for 5 minutes before stirring so it can soften which will help it to blend more evenly and easily. You can use the chicken in any of the suggestions at the top of this post, or get creative and use it to make another meal. No matter how you choose to serve it, I hope that your family enjoys it as much as mine! This creamy Crock Pot Ranch Chicken is tender and delicious! It is filled with ranch flavor and only takes a handful of ingredients and a slow cooker! This is perfect to serve over rice, greens, or on a sandwich. Keep the recipe handy because it is a family favorite! If you are gluten free, use homemade ranch seasoning and ensure the chicken broth you choose is gluten free. Yumm. Made this dish and it was full of flavour. The family loved it.